With a delicate fruity aroma, silky texture and light lemon taste, this 100% extra virgin olive oil is crafted in Liguria Italy, and is essential to fine dishes as its delicate aromas raise flavors to new heights while not obscuring their essences. Accompanying the olive oil is a bottle of premium balsamic vinegar, perfect for bread, salad, pasta, salmon, and chicken. Serve the olive oil in this ceramic terraced dish whose shape is inspired by the tiered hills of Umbria, Italy, designed by an artist who spends her summers in a converted olive oil mill. The terracing of the dish displays the gradation of the rich olive oil hues and are a marriage of form and function - a feast for the eyes and tastebuds. Italian Ascheri Limon Extra Virgin Olive Oil - 200 ml. Italian Ascheri Balsamic Vinegar - 200 ml. Terraced Ceramic Olive Oil Dipping Dish. Your gift is securely wrapped to safeguard the shipping process, and arrives presentation-ready in our signature gift crate. A complimentary card with your personal message is included with your gift. Measures 7" x 10" x 4". Italian Osteria Gift Set is a hand delivered gift. These gifts are delivered by one of our local design centers located throughout the United States and Canada. Same day delivery is available for most gifts when ordered before the cutoff time. The cutoff time for Italian Osteria Gift Set is in the recipient's time zone. Ligurian Balsamic VinegarEnjoy this luscious balsamic with grilled meats, roasted potatoes, tomato and mozzarella salads, savory cold cuts like prosciutto, ice cream and fruit salads. It is ideal with seasoned cheeses like Parmigiano. 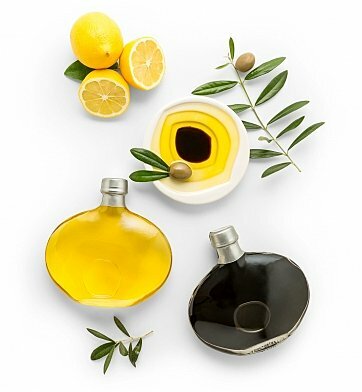 Ligurian Lemon Infused Extra Virgin Olive OilYou'll love the superb flavor in this lemon-infused extra virgin olive oil pressed from a blend of local olives and infused with famed Ligurian lemons in western Liguria. Use in salads, drizzle over fish as a finishing oil, or bake a lemon olive oil cake. A perfect compliment to bitter greens. Comes in an attractive round bottle. Made with 100% Ligurian Olives from Italy.